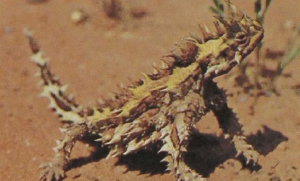 This curious lizard, about 6 inches long, occupies some of the driest regions in the center of Australia. Its grotesque appearance leads to a name which does injustice to this harmless creature. The lizard’s shape and color provide a camouflage matching the background. Apparently the animal feeds only on live ants and is, consequently, most difficult to keep in captivity. Its adaptation to a desert environment is extreme: not only can it avoid drinking for long periods but it also has a microscopic striation of the skin covering the head scales, allowing it to utilize dew which, by capillary action, flows down these minute ridges to the edges of the mouth and is then swallowed. 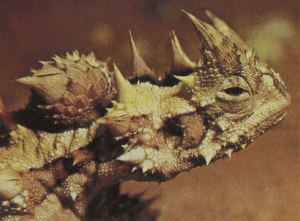 The Moloch thus occupies the same place among the agamids as the horned lizard does among the iguanids.